I've been so afraid to wear a pair of flared denim. Mainly because I'm short and thought it would not be flattering and I seriously rely on those skinny jeans too much. While out shopping a few weeks ago, I decided to grab a pair and walk towards the changing room. I tried them on and thought "Well this isn't so bad!" They have a laid back feel and it probably helped that I was already wearing heels. 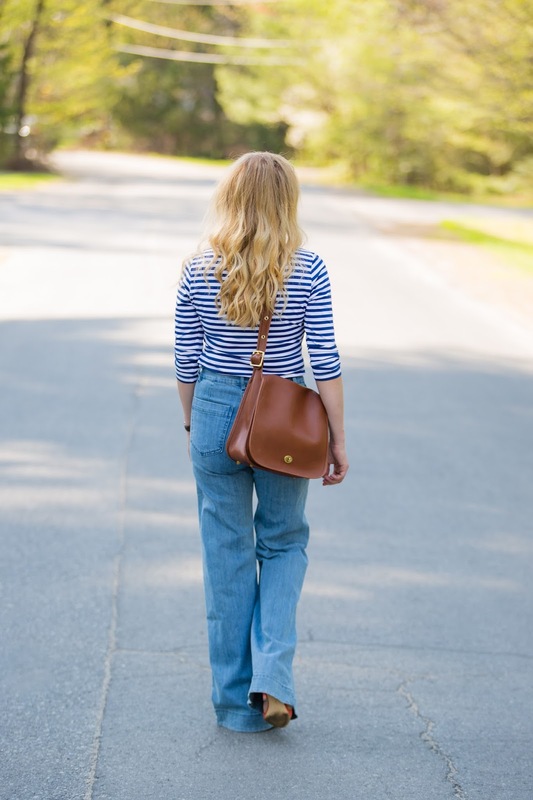 They are forgiving (right where I need it to be) and flattering, accentuating the curves I actually wanted to accentuate The hem skimmed the ground perfectly, so if you're shopping for a pair consider the shoe you want to wear with them. Just make sure they are a heel. Doesn't matter how high or low the heel is, flared denim is made to be worn with heels so there is room for some flow. Since Montreal was a little colder earlier this month when I shot this look, I paired it with a super light, three quarter sleeve tee. Perfect for the cooler days without having to sport a coat. This will be worn a few times this summer since weather here is so unpredictable and colder days will surely happen. Hope you have a great week! These look great on you, but outside of that I just can't get behind them haha. I was hoping flared pants would never come back in style hahaha. They never looked good on me, personally. These ones look chic with how you dressed them up, though! I think they are very flattering on you! I used to love flared denim before skinnies took over, but I haven't gotten back to them this time around. I need to pick up a pair! Oh thanks for saying that! I was so scared to wear them. My husband not liking them was probably why I wore them. Haha! They look great on you!! Such a fun vintage looking outfit!! I love that flares are back in style! Your outfit is cute! 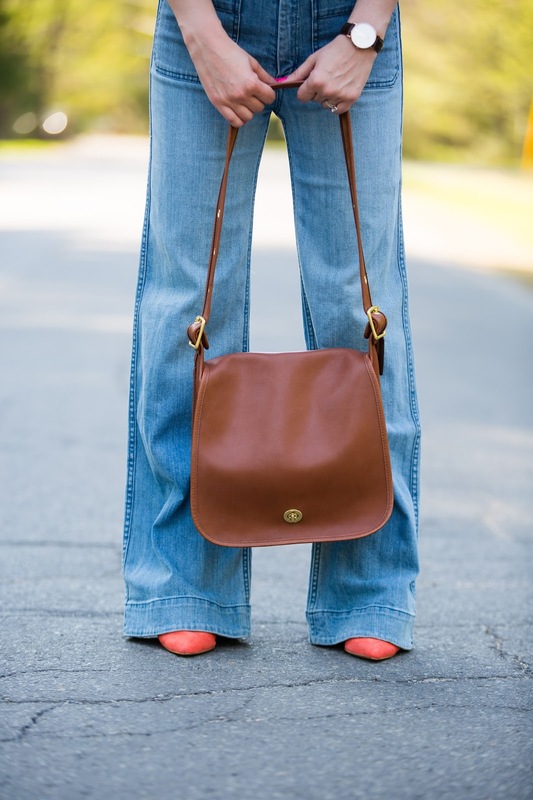 I'm obsessed with flares right now and this pair looks amazing on you, also love your classic Coach bag! Love these on you! :) I've always been a fan of flares - those shoes sure make them pop! The twelve year old girl in my rejoices with the return of the flare! I thought they were the coolest in middle school, and still do. Stopping in from the Wed Pants Link up. Love the pop of color in your shoes. I'm linking this flare look (again, things always come back), but I find it hard to wear when they are too flared. I'm 5'1. This looks great. Love your bag. I had a pair of those a few years ago. I wish I kept them!!! Also, love your purse! 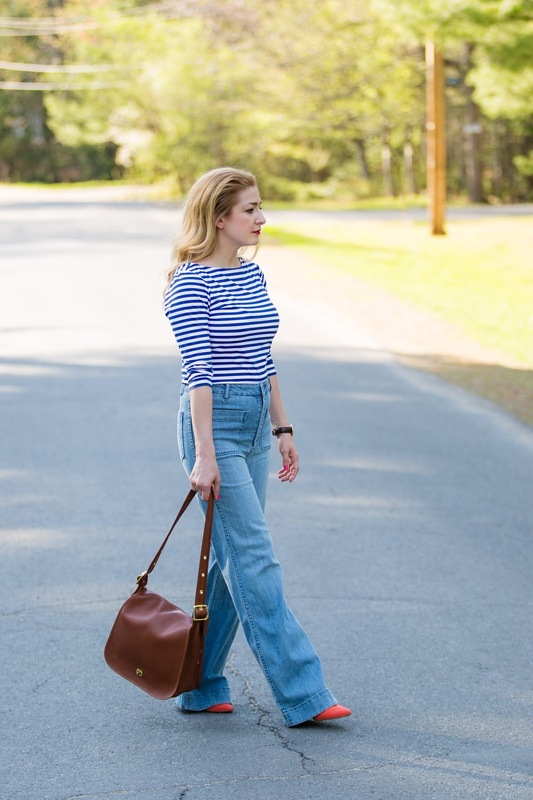 Your flared jeans totally caught my eye from the link up! I love the high waist and how you styled them with the stripes and red heels. That coach bag is amazing. Such a classic. Great flared jeans, love it with the striped top and bit of red. I need to bring mine out of the closet! Thanks for sharing with Fun Fashion Friday & I hope you're having a fab weekend! Glad you tried these jeans on and bought them, they make your legs go on for miles! I love it with the pop of color with your heels. 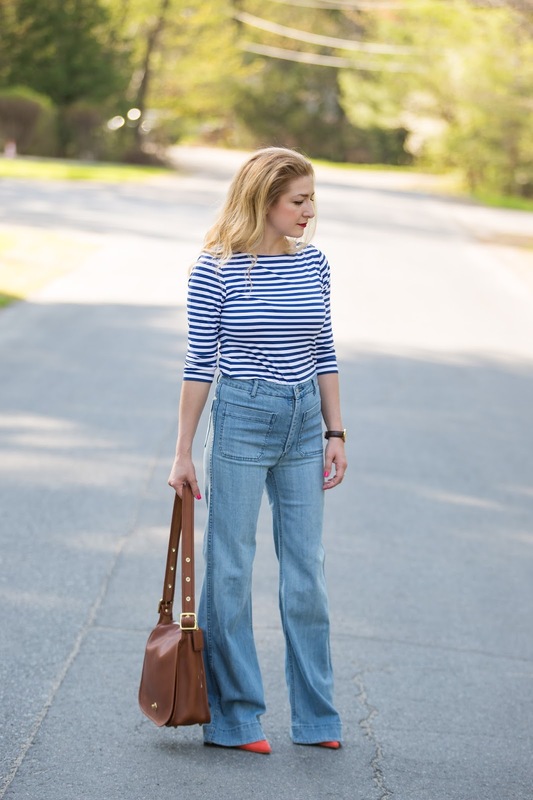 I love a good comfortable flared jeans , but I still feel torn (pun intended…) about the overly distressed look! I like the minor distressed parts on a jean, but still undecided about the whole knee showing!